To Register click on Donation Button below. Registration after April 7 can participate but will not be included on the map. Please be sure to include your name, address, email & items for sale at the in the NOTES Section. First 100 participants will receive a Sign from our Sponsor Liberty 100 Realty, Your Home Town Realtor. Maps will be available online at waldwicknj.org on Friday April 12.
or Email us at [email protected] for a PDF list of homes participating. Banners provided by Graphically Speaking - northjerseypromos.com. If you cannot pay electronically email us for a registration form. What is the Waldwick Education Foundation? The Waldwick Education Foundation is a Non-Profit corporation established to identify the special needs of Waldwick's School System and to raise funds to meet those needs. Funds raised go directly to the Waldwick Public Schools to enhance the education program. Established in 1992, the foundation has raised over $312,000 for the Waldwick School System. The Foundation funds specific programs outside the school budget that enhance and support the excellence of education. Every child from K-12 benefits from funds raised and every school benefits. Our goal is to fund new innovative programs and projects which enhance the education program. We want to make our school system the best and give our teachers the tools to do that! The WEF is run entirely by a board of volunteers & trustees from our community. Many members of our community and our local businesses support the WEF's fundraising efforts by with talents & time. Contact us at [email protected] to learn more about how you can help. 1. Get Involved and be a part of the WEF, we need Trustees! 2. You can Donate to the WEF. 3. Do you own a business? Become a WEF Sponsor! Support the Local Businesses that SUPPORT our SCHOOLS! Garage Sale Map can be viewed by Clicking on NEWS see above. 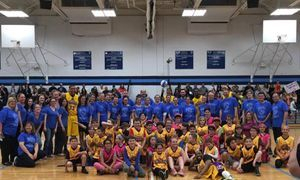 Dr. James Bancroft his Staff & All the WONDERFUL & GENEROUS TEACHERS & STAFF who volunteered their own personal time to help raise money at the 2016 Harlem Wizards WEF Fundraiser. $2,500 DONATION to the Waldwick Schools!